Manchester City playmaker Kevin De Bruyne has lifted the lid on his half-time outburst in their clash against Napoli on Tuesday night – playing down the situation which at the time looked quite intense. However, the 26-year-old took the time to discuss the incident after the match – which City eventually won 2-1. 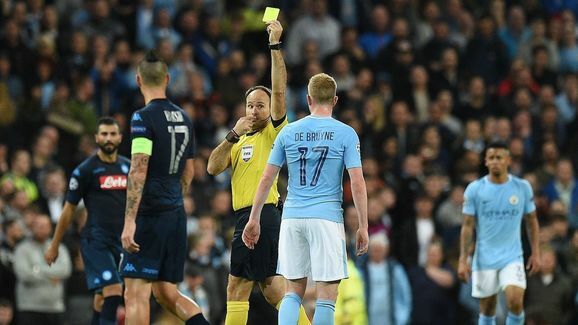 ​”No, I think we had a little discussion at the time, it happens.” De Bruyne said after the game, via Metro. “There’s nothing wrong, after one minute then it’s over. “I think at home I also get into some arguments with my wife, I think it’s normal. “I think it’s necessary. But now everything is okay. Despite their strong attacking ability – which was once again shown in the opening stages at the Etihad Stadium on Tuesday night, City will be putting most of their praise on goalkeeper Ederson Moraes after their victory. The Premier League leaders gifted Napoli two penalties during the Champions League tie, and despite conceding the second, Ederson managed to save the first spot kick that came his way – which played a huge role in City’s win.